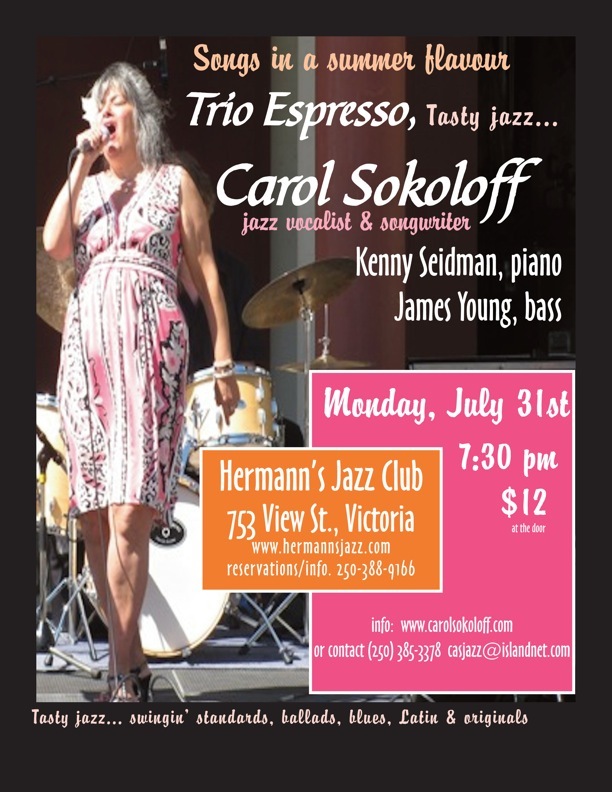 Jazz vocalist and songwriter Carol Sokoloff presents 'Songs in a Summer Flavour', an evening of tasty jazz with the swinging vocal/piano/bass Trio Espresso, featuring jazz standards, both well-known and obscure, as well as original songs for a romantic summer night. Known for her warm voice, thoughtful approach to standards and remarkable original songs with the sound of the standards, vocalist Carol Sokoloff appears with the very swinging Kenny Seidman on piano and the dynamic James Young on upright bass. Carol Sokoloff has appeared on many local stages including Jazzfest and Summer in the Square, and at various jazz rooms in the city and elsewhere. Audiences especially appreciate Sokoloff's original songs and many will be performed including "Summer Nights" from her CD 'Let Go! ', a song which moves from atmospheric to heated Latin rhythms, and the more recent ballad, "When Summer Comes", as well as the upbeat "Let's Dance" and "Fly Away" and others. Better known blues, ballads and bossas also on the bill.